Every working professional needs high quality of education if they want to grow in their professional world. Masters of Business Administration is the most trending educational course among students these days. 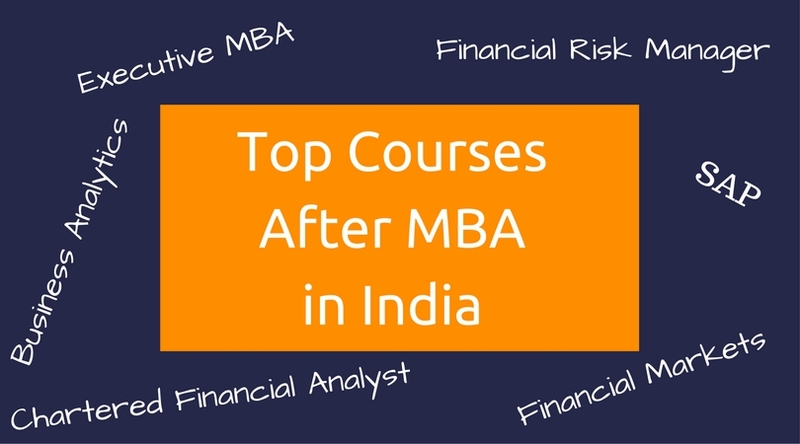 But, there are many different courses available in India after completing your MBA. These courses have high value and open more doors in your career. The benefits of doing an educational course after MBA includes high salary, a better job, enhance skills and many others. Use of analytics is growing in the market so the organizations are hiring people who understand data and know the ways to analyze it. Big companies always have vacancies for data managers because there are very few people with this education. The main motive of the program is to provide the skills and practices to students for analyzing the past business performance to make future business planning. It teaches the different ways of business planning using statistical methods and data. It is one year course in which classes are planned in the beginning of the program. It is a challenging program that needs full day teaching as well as includes evening guest lectures. It is a doctoral program in management which provides deep knowledge of management to doctoral participants. The course offered by different IIM’s is globally recognized. The FPM programme provides students with source of interdisciplinary and rigorous research in different business management as well as public policy which includes Decision Sciences, Corporate Strategy & Policy, Finance & Accounting, Production & Operations Management, Marketing, Human Resources Management, Public Policy, Economics & Social Sciences, Information Systems and Organizational Behaviour and Human Resources Management. NSE (National Stock Exchange) academy offers different modules that cover various areas of the banking, financial markets, financial services and financial literacy. It is an online certification and testing program which offers the skills and practical knowledge required to grow in the financial markets. NSE has test centers all over India. Executive MBA program is for experienced professionals who want to be at a higher level in their work. The senior professionals can continue their full-time job along with the course. The skills learned in the program by working professionals could be instantly applicable to them in their workplace. Different colleges require different work experience and position to be eligible to take admission in this course. Top IIM’s institutes offer this course which is very popular among working professionals these days. Ph.D. is the highest degree offered in the management science. The minimum duration of this program is 3 years while maximum duration is 6 years where there is no bar for the age to take admission in this course. The course aims to offer under-training professionals the skills to investigate various issues in their area of study. The person taking admission in this should be a Master’s degree or an M Phil Degree holder with minimum 55% marks in the relevant discipline. Chartered Financial Analyst is a professional program offered by different institutes to financial and investment professionals. The professionals who successfully complete this program are awarded “CFA charter”. Professional usually takes an average of four years to complete and earn their CFA charter. There are many institutes in India for CFA like The Institute of Chartered Financial Analysts of India (ICFAI), IBS and many others. The professional taking admission in CFA should have qualified work experience according to institute requirement. Financial Risk Management is the study of economic value using different financial instruments to manage the risk, credit risk, operational risk and market risk. There are other types of risk included in this study which is Foreign exchange risk, Volatility risk, Inflation risk, Legal risk, Sector risk, Shape risk, Liquidity risk, Business risk, Reputational risk and many others. The professional who completes this program gets a different profile like Chief Risk Officer, Head of Operational Risk, Financial Risk Manager, Senior Risk Analyst and Director of Risk Management. This program certificate is globally recognized. Doctor of Business is research doctorate degree for the advanced research and study in business administration field. DBA is a degree in business administration and is equal to the Ph.D. in Administration. This program is basically to become the researcher in the field or the professor in some university. The DBA professionals could keep working in their organization and could teach as guest teachers in the universities as well. This program makes the professional eligible for the research work in the relevant field. Systems Applications and Products is an educational program to learn all the capabilities and features of using SAP. SAP’s various features offer the capability to manage financial assets, plants, materials, cost accounting, production operations, personnel, and archived documents. SAP is used in all industries making this program more valuable. SAP certification is divided into two courses i.e. functional course and technical course. The technical course focuses more on coding modules. The duration of this program varies in different institutes. PGDCA program is done on computer languages like Java, C, C++, Packages which includes MS Office-Web Design, TALLY, Oracle-VB, MS Dos-Windows as Operating System for data processing and system analysis. The duration of the program is one year and can be done either full-time or part-time according to the choice of the student. There is no experience required for this program. Any student with graduation in relevant field from aggregate college is eligible to take admission in this program. Personality development course can be done at any stage in your career. You can go for this course after MBA to enhance your public speaking skills and confidence. The duration of this course varies and depends on the applicant requirement. The professionals who are working could do this program as part-time to improve their personality and do well in their current job. Students who completed the MBA could use this course to be confident in the interview.